Hansel & Gretel are bounty hunters who track and kill witches all over the world. As the fabled Blood Moon approaches, the siblings encounter a new form of evil that might hold a secret to their past. 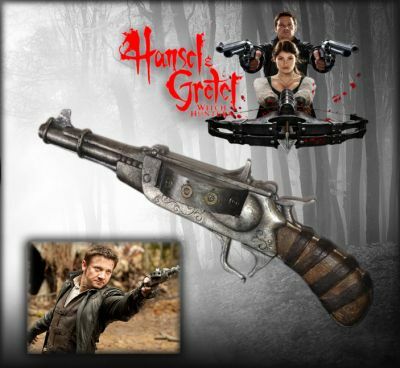 This is Hansel’s (Jeremy Renner) stunt turret pistol screen used and matched in the 2013 film, Hansel & Gretel: Witch Hunters. This pistol was originally seen when Hansel picks out his weapons of choice from a wooden cart then later can be matched to the screen cap of Hansel pulling and pointing the weapon in a close-up in the film. This particular style of pistol having a steam punk type of design was also listed to have been based off a weapon known as the Porter pistol which also has the horizontal type turret that houses the ammunition.